In the much-anticipated follow-up to Pretend Soup, celebrity chef Mollie Katzen cooks up 20 new vegetarian recipes that kids six and under can prepare themselves (with a little help from their adult assistant). The last decade has seen unprecedented demand in healthy eating for kids. Taking this interest one step further, Mollie Katzen presents kid-friendly recipes that will inspire joyful kitchen adventures and food appreciation. With Salad People, children will enjoy a lifelong love and playful respect for nutritious food from Tiny Tacos, Counting Soup, Salad People, and beyond. 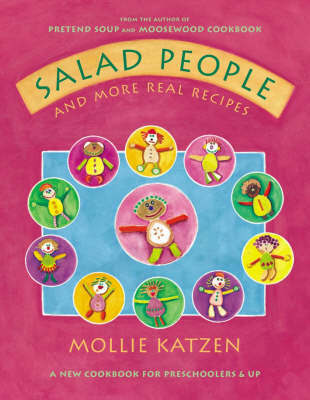 Complete with kitchen tips, safety and behavior rules compiled by actual kids, and thoughtful observations on what children gain from cooking, Salad People is the model children's kitchen guide for a new decade.